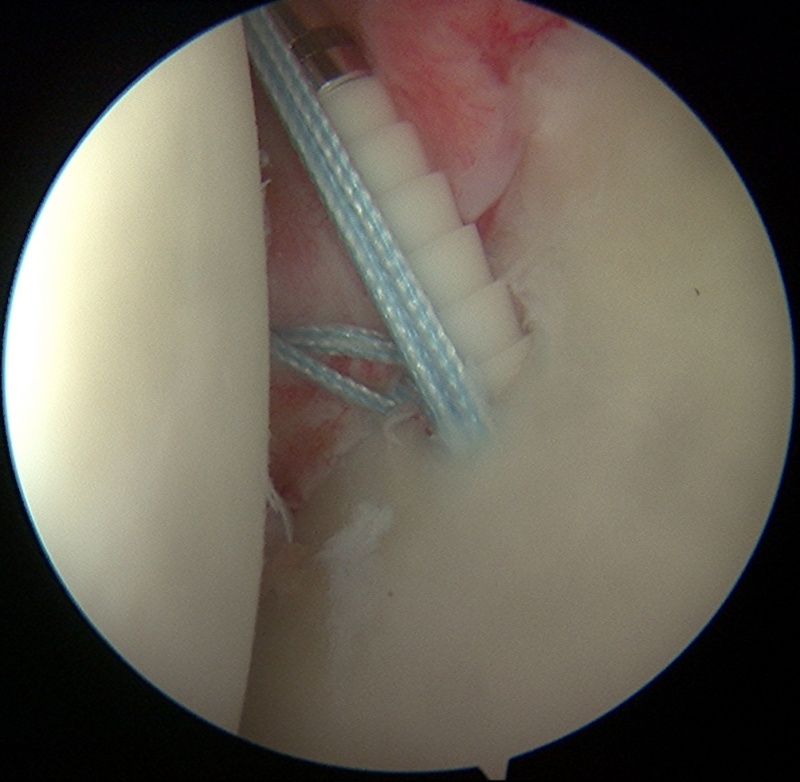 Learn the Arthroscopic anterior labral repair shoulder stabilisation (Arthrex 2.9 Biopushlocks) surgical technique with step by step instructions on OrthOracle. Our e-learning platform contains high resolution images and a certified CME of the Arthroscopic anterior labral repair shoulder stabilisation (Arthrex 2.9 Biopushlocks) surgical procedure. The glenohumeral joint of the shoulder is the most frequently dislocated joint accounting for 45% of all dislocations with an estimated annual incident of 1.1 per 1000. The majority of patients are male in their second or third decade, sustaining the injury during contact sports. Typically, injuries occur during rugby, football, martial arts or falls from cycles. Anterior shoulder dislocation usually occurs with the arm in the abducted and externally rotated position and leads to predictable patterns of injury to the labrum, capsuloligamentous structures, glenoid and humeral head. The Bankart lesion is an avulsion injury of the labrum with or without capsular injury inferior to the equator of the glenoid is the most common but other pathologies are seen. A lesion in which the anterior band of the inferior glenohumeral ligament (IGHL), the labrum and the anterior scapula periosteum are displaced as a sleeve from the anterior scapular neck (anterior labral periosteal sleeve avulsion – the ALPSA lesion) was described by Neviasier and less commonly a humeral avulsion of the glenohumeral ligament (HAGL lesion) can occur. Complete mid-substance tears of the capsule and IGHL also occur. A Bankart lesion in itself is not sufficient to result in recurrent instability in pathological studies. Plastic deformation of the IGHL occurs either at the time of initial injury or during subsequent instability episodes and it is the combination of the two that cause recurrent instability. It is important to look for bony injuries such as glenoid rim fractures or the Hill-Sachs impression fracture of the posterosuperior lateral humeral head. Soft tissue capsular labral ligamentous and labral injuries can occur during shoulder injury without dislocation or subluxation. Associated injuries from shoulder injuries must also be excluded such as fractures to the greater tuberosity and acute rotator cuff tears whether partial thickness or full thickness. Typically, first time dislocations are treated conservatively with immobilisation in a sling in internal rotation however there is a trend towards offering early arthroscopic soft tissue repair and hence stabilisation. Recurrent instability is common in younger patients with high risk activities. Typically, such injuries are offered surgical stabilisation such as is described. Risk of recurrent instability ranges between 26-95% after non-operative treatment. The wide range reflects population differences between series of different lengths of follow-up. Most of those with the highest recurrence rates have included highly selected groups such as military cadets and contact athletes. A clinical assessment should include careful history taking, clinical examination and appropriate investigation initially with plain radiographs in three views (AP, lateral and axillary). Subsequent investigations should involve an MRI with intra-articular contrast to provide an arthrogram. This will allow contrast to delineate the damaged soft tissue structures within the glenohumeral joint.